A vegetarian smoked sausage. 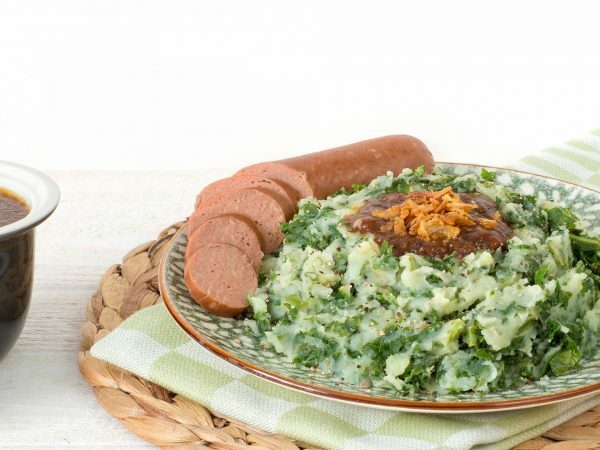 This product is delicious with kale stew or sauerkraut. Of course, the sausage can also be eaten on a bun. The smoked sausage weighs 90 grams and is also available in slices. Water, 15% vegetable protein (soy, wheat gluten), rapeseed oil, egg white*, natural flavourings, dried onion, rice bran, yeast extract, dextrose, salt, wheat flour, smoked water, extracts (onion, garlic, spice), sugar, mineral (ferrous fumarate), vitamin B12, colour (E172). * free-range eggs. Pan: 5 minutes heating in hot water, do not boil. Microwave: 1 minute at 750W (3 pieces).